“Just as Buddhas are covered with gold, so people want fine clothing” (Chinese proverb). In 1997, I started changing my Barong Tagalog wardrobe from the Santana of the 90s to the Gusot Mayaman of the 2000s. Of course before the Santana we have the chiffonile of the Elvis-collar fame. While the never-out-of-fad Piña and the hand-woven embroidered Jusi remain the all time favourite. We remember the barongs of the 50s made in elegant pespuntes (back-stichery) and the bordado a realce (embossed embroidery) popularized by Sen. Pelaez, Presidents Macapagal and Marcos. 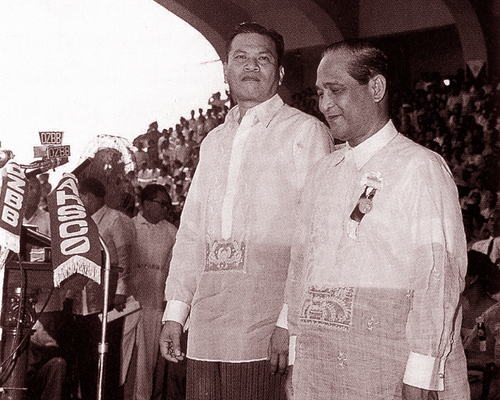 It was Marcos however who elevated the status of the Barong Tagalog as a truly Filipino costume. The barongs made from Pina and Jusi, save their design of circa 70s or 80s, are still the preferred formal attires in our traditional celebrations like weddings, anniversaries, and other family milestones, and in our usual conferences and conventions, lest we be indicted for not being dressed for the occasion. We remember the Pina and Jusi barongs in the 70s and the 80s as the veritable pamburol. Today they are still the old reliable. Pina and Jusi have the reputation of a hefty price tag such that they are reserved in our cabinets for some extraordinary event. Whether our barong of old is styled pechera, raya, or chanepa is of no moment as any barong for that matter worn in a very special occasion is an audacious fashion statement. In between the polyester and the Jusi is the revolutionary Gusot Mayaman. I simply love the Gusot Mayaman. It has a distinct comfort not felt in other fabrics. Pina and Jusi have that prickly feel that evolves into itch. Gusot admits of generous ventilation. Its level of comfort is simply truly made for the tropics. Any other material like the chiffonile of old traps the skin pores leaving the wearer prone to sunstroke. The Santana is too soft that once worn, looks like a wet suit sinking by the contours of the wearer. Gusot has generous cotton content plus some polyester to keep it in form. However your bearing is, the Gusot is inclined to crease. And that is the magic of the Gusot. The first edition of the Gusots was not recommended for starching and the wearer lets it all crumpled that at the end of the day he looks near to craggy. Because of the forlorn look, some aficionados of the Gusot started applying starch to stiffen it. The results are simply fantastic; the wrinkles are far between instead of the skin of an 80-year old detritus. It is when the crags look like the Benguet mountain range, the ridges sharp as a balisong, the slopes well-pressed like the denuded Mt. Arayat, and in general does not hug the physique of the wearer, that is when the Gusot takes a life of its own. I remember in 1999 when I was invited to speak before the graduating class of my High School alma mater, I brought along my first sky-blue unstarched Gusot Mayaman. Expectedly, since it was hanging behind the driver’s seat and some luggage pressed on it, the Gusot was, when I reached Calauag, nagusot. But I was of the impression that it was really what it was. That my audience would understand that what I was wearing then was the national costume of the Makati crowd. I forgot that I was in the province where the first rule of appearance in a public place is, your right, clothed for the occasion and to hell of what is in fashion. My sister was simply aghast when she saw me wiggling myself into the attire. The Gusot all the more got crinkled. Her protests of “don’t ever leave without pressing that rag” fell on deaf ears. I went to the town plaza proudly donning the garment of the century. I must admit I felt a bit lousy in that barong, you could tell, not because of its multiple creases, but I felt my pants then did not match the sky-blue. That was the last time I get invited to my alma mater. You said it, I saw my old principal grimacing in disgust her face aped my Gusot. Since then I made it a point to apply almirol to my Gusot Mayaman. It must live up to its reputation as the don of the royals. I started buying the aerosol starch, a dent in my Gusot admittedly. The can can only handle four Gusots, and it goes empty and yet the result is far from fitting, no pun meant. And there goes my empty crumpled pocket. But my ever loyal lavandera has an idea; let us go back to the old fashioned way of almirol: Gaw-gaw. And voila! The transformation was truly magical. The generous application of the cheap gawgaw altered the landscape of my Gusot. There it was standing on its own ready to work ahead of me! The Gusot is the preferred office wear of the working man in Makati. Most practicing lawyers are now draped in Gusot. You could tell if the lawyer is an old practitioner by the type of his barong. It also sets apart the malls and hotshots security group by their immaculately white and eternally unruffled barong. The Gusot polo barong has gained ubiquity hereabouts. Again the Gusot polo, and now the shirt-jacks, defines the middle-upper level executives from the rank-and-file who are swathed in thick polyester polo barong. Whenever Nordy Diploma sees me in my starched shirt-jack at Greeenbelt, he says he reminds me of McCoy and Danding, both shirt-jack diehards but of the Jusi specie. City executives favour the Gusot than the long sleeves with tie because of its practicality. It’s comfortable and it hides the tummy and the receding buttocks, and saves one from the expense of a liposuction. Price-wise it is more reasonable than the Jusi, yet retains some mystique as it is not for everybody. A Gusot polo barong or shirt-jack costs between P1,000.00 – P1,500.00. The Gusot Mayaman barong costs anywhere between P1,500-3000.00 including some fancy expensive buttons. Whereas the polyester or the tetoron barong is between P500-P750, and easier to maintain or none at all. So however you figure it out, pun meant, I recommend the Gusot Mayaman in generous almirol. Yung loob na side po ba muna ang planstahin? Then yung sa labas naman po? At last naman yung kwelyo? Clarify lang po, After laban yung polo, ibabad naman sa gawgaw? Hi sir Sonny, do you mind going through the steps as to how your lavandera washes your barongs? And the recipe of the almirol? Thank you! 7 Voila! Ready to Boogie! Quality Gusot Mayaman barongs for only P650-P950! Please visit http://www.darlingdaze.multiply.com for more details! uy mura yan, ah. thanks for the tweet.